What in the world is tick paralysis? 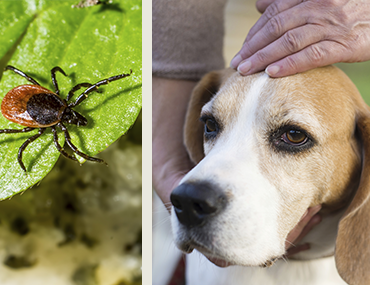 It sounds like a disease that leaves ticks paralyzed; unfortunately, that’s not the case. Tick paralysis is a rare but serious condition caused by ticks. In North America, dogs are typically affected. Tick paralysis can also afflict people—especially children. Most cases occur when ticks emerge from hibernation between April and June. Dogs usually develop symptoms within 2-7 days of being inoculated by a tick. Since tick paralysis causes an ascending paralysis, the rear limbs are initially affected. At first the animal may appear weak or unsteady because their rear limbs are weakened. The symptoms quickly progress to paralysis (inability to move) and the involvement spreads to the trunk, upper extremities, and head. Animals can die of respiratory arrest if the diaphragm becomes involved. The diagnosis of tick paralysis is made if the animal shows the symptoms and an attached tick is found. Your veterinarian will perform a thorough examination since ticks can hide in your pet’s coat. Since the paralysis is caused by the release of the neurotoxin from the tick, the primary treatment is to promptly remove the tick. Removal can be done mechanically by pulling off the tick with forceps or using a topical insecticide to kill the tick. Once the tick is removed most animals begin to recover their muscle strength within hours—followed by complete resolution within 3 days. If an animal is suffering from respiratory distress, supportive measures such as supplemental oxygen and mechanical ventilation are necessary until the effects of the neurotoxin fades. While it's rare, tick paralysis can be a deadly condition. The best way to prevent tick paralysis is to take preventative actions. If you live in an endemic area for ticks, be sure your pet is on tick preventatives. Check your pet for ticks on a daily basis, and especially after hiking in wooded areas or heavily infested areas. Finally, keep your landscaping maintained to make them less inviting for ticks.